How to make contactless payments more secure? How many of us carry around much cash in our wallet anymore? In this day and age, most shoppers are getting more and more accustomed to cashless transactions. Let’s face it, it’s simply more convenient. These days, there’s a very small number of businesses that don’t accept card payments. And the number continues to decline, as cash only businesses find that customers have simply become used to paying with their debit or credit card. As a business owner, you could even lose sales as customers turn elsewhere to save themselves the bother of withdrawing cash. Most businesses are fully aware of this, and you’ll find many of them now offer payment via remote credit card terminals. Taking your card to the till is unnecessary in most restaurants and some stores. Customers can make a payment directly from their seats or on the sales floor. The rising usage of handheld devices combined with the cashless trend has resulted in a new payment method that is even more flexible and portable than remote card terminals: the mobile card reader. In this article we’ll take you through everything you need to know about mobile card readers, and whether they could be the right choice for your own business. 1. What is mobile card reader? What exactly is a mobile card reader? A good place to get started. In a nutshell, a mobile card reader is a small device which can be attached to a tablet or a smartphone via Bluetooth or a headphone jack. 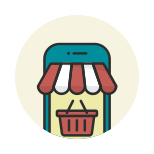 When combined with a supporting app, it allows merchants to process debit and credit card transactions using a mobile device. 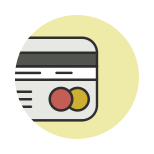 Mobile card readers can be used for all three types of card transactions: contactless, chip and pin, and magstripe. All you need to operate the device is a supporting app and Wi-Fi or mobile network coverage. The app includes all the necessary point-of-sale features in an easy to use interface, such as invoicing and receipts. 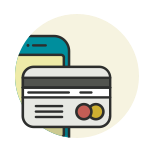 With the mobile point-of-sale (mPOS) technology, payments can be accepted anywhere. No longer is the point of sale stuck in a fixed location. This technology can lead to a plethora of benefits, including efficiency of sales procession and potential revenue growth by being able to accept transactions anywhere. Mobile card readers usually cost very little. And users of these devices only have to pay a small fee for each transaction, with no monthly fees. How do mobile payment systems differ from traditional credit card terminals? You may be thinking that this is nothing new, and you’ve already seen a mobile card reader in every single restaurant you’ve been to. What you’re probably thinking of is a remote credit card reader, and it’s an easy one to confuse with mobile readers. Traditional card terminals are connected to the server via GPRS, landline or an Ethernet cable, and consumers would primarily use the chip and pin method to authorise payments using these. However, these are NOT the same as the new mobile card readers that connect to a smartphone or tablet, as they can only be used within a certain range. They can not be used outside of the premises of the business. Connection. If you’ve ever used a traditional card terminal before, you’ll be relieved to find that the connection for mobile card readers is much more reliable. We’ve all had a frustrating incident with a traditional card reader that just refuses to process your payment due to a glitch or a bad connection, even when it’s near its base unit. This is because they are connected via a landline, Ethernet or GPRS technology, so they can only be used on their premises. With mobile card readers, connection issues and being tethered to a base unit is a thing of the past. You can use them anywhere you have Wi-Fi or mobile network coverage. This is really what makes it a game changing device for businesses everywhere. Size and portability. With a mobile card reader, you have an extremely lightweight and compact device that is easy to transport and use anywhere. Traditional terminals are bulkier and heavier devices. Next to a mobile card reader, they can look somewhat dated and old fashioned. Cost is a major point of difference between traditional terminals and mobile readers. This is especially relevant for small businesses, as having to pay monthly fees for the data connection and rental costs for the terminal is just not feasible for many business owners. In comparison, mobile credit card readers are much cheaper and require a one off payment with no monthly fees. It is not a huge investment for a business of any size, especially considering the benefits. How exactly does a mobile card machine work? We’ll take you through this step-by-step. Here’s what you need to do to get started with a mobile payment machine (and it’s easy peasy!). The first step is registering with one of the mobile card machine providers (which we’ll talk about in more detail below) and investing in a shiny new mobile card machine. Download the free app recommended by the provider of your choice onto your smartphone or tablet. Use the login details provided to you during your registration process. As is the norm now, these apps are all compatible with both iOS and Android devices. Connect the app you’ve just installed with your new mobile payment machine. This can easily be done using wireless or Bluetooth. You will receive a manual with your mobile card reader, and a clear set of instructions within the app to help you through the connection process. And that’s it. You’re all set! Time to process your first payment. Start by entering the sale amount into your card payment app. 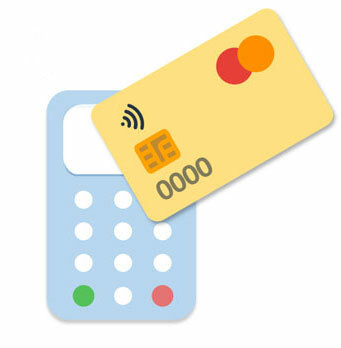 Using the mobile card reader, process the card payment either through the chip and pin, magstripe or contactless method. Ask the customer to enter their PIN number into the mobile payment machine. Choose whether to print the receipt or send it to the customer using email or SMS. And you’re done! Simple. How much is a mobile card reader going to cost me? So, we’ve established that mobile card machines are a much more cost-effective option than traditional credit card machines. But exactly how much cheaper are we talking? The cost of the card reader itself: This can range from £59 to £65 with most of the big providers. They also often have promotions on for the mobile payment machines, so keep an eye out for these. The transaction fee: These can range from 1 – 2.75% per market. The volume of transactions processed will determine the fee that you pay. The higher the number of transactions, the less you have to pay for each one. How can you ensure you get the best price for your business? 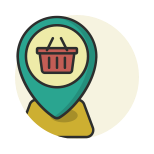 Do your research between all the different processing providers.As with anything, shop around. You’ll find a range of companies that will be able to process mobile card transactions for your business. We’ve listed some of the most popular ones below. 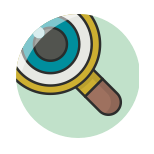 Check for reviews from previous users as well, and ask other business owners for recommendations. Flexible payment structures. Some mobile card machine providers offer flat fee structures which are recommended for smaller businesses that don’t process a large amount of card transactions. Flexible fee structures are a more cost effective option for larger companies. Within this structure, the more transactions you process, they less you have to pay per transaction. Beware of hidden fees! Take your time going over the details of the processing company’s rates to ensure you don’t commit yourself to paying any additional hidden fees. What types of businesses are mobile payment machines best for? Any business that offers its services outside the range of its business premises would benefit immensely from mobile card readers. 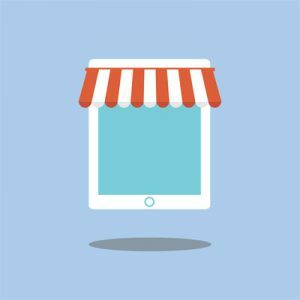 Examples include sole traders, small businesses that may not have a physical store or people who sell at markets or door-to-door. Without a mobile payment machine, such businesses can only accept cash or cheque payments, which customers may find inconvenient. This may lead to unfulfilled orders that could have been instant sales. Let’s face it, many people don’t even have cheque books anymore! Another benefit is the reduced risk of theft as businesses don’t have too keep much cash on them at any one point. Bad credit is also no longer an issue, as can be the case when accepting cheque payments. For larger businesses, the introduction of mobile card readers into their retail environments can change how their employees interact with customers on the sales floor. Sales personnel can engage a shopper, make a sale, and secure an instant payment before the customer loses interest. What are your customers’ purchasing habits? Consider your target market. Are the majority of your customers part of the large group of people who prefer cashless translations? Or are most of them okay with paying cash? Some light customer research such as a survey could be useful to help you reach a decision. By introducing mobile card machines, will your business be able to generate more income? Brainstorm how you could possibly use a new mobile payment system to open potential new revenue streams for your business. This can be possible as with a mobile card reader, as you’ll be able to make sales from virtually anywhere! Does it make sense to get a mobile card reader considering the volume of card payments you process? Ultimately, the mobile payment machine option only makes sense for a business that is processing a good number of credit or debit card transactions. Break down your annual sales by payment methods to gauge whether it would be a worthy investment for your business. How secure are mobile card readers? Concern regarding security in completely understandable when it comes to a new payment method. Many customers may initially be wary of using it for the first time. You can rest assured that mobile card readers are extremely secure if used correctly and using a reputable provider. Throughout the transaction, any data that is stored in a debit or credit card will remain encrypted. 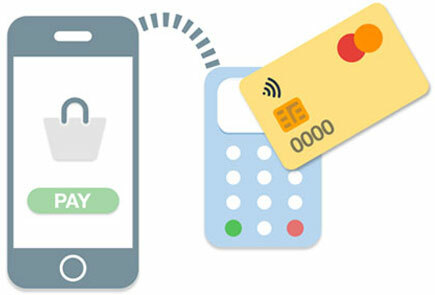 The seller will have no access to sensitive account information, and customers will only be asked to enter their pin once their card’s data has been read. Most mobile card reader providers also follow a strict set of guidelines, such as the OWASP or PCI DSS (Payment Card Industry Data Security Standard) guidelines. 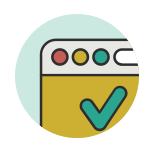 A PCI certification can give you the peace of mind that the provider’s network is secure. Look out for the EMV (Europay, MasterCard and Visa) seal of approval as well for extra reassurance on the security of your provider. Who are the primary mobile card machine providers in the UK? One of the first mobile card machine providers in the UK, iZettle launched their first card reader in 2011. 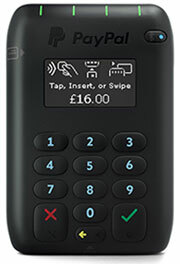 It’s currently the most popular option for mobile card payment machines for small businesses. 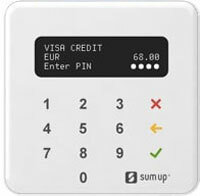 SumUp started out 5 years ago and has since expanded into 16 European countries. 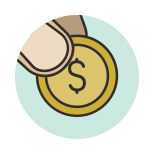 Offers the lowest initial transaction fee within the market, of just 1.69%. This makes them the most inexpensive option for those businesses who may not know what their monthly transactions will amount to. No fixed monthly costs and no contract. Paypal Here is the mobile card payment solution offered by PayPal. The credibility of its affiliation with such a well known brand could work in its favour in this relatively new market. Payments can reach your PayPal account in a matter of seconds. No fixed contracts and no monthly fees. 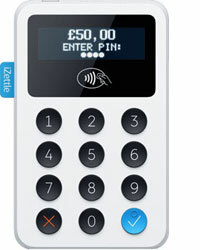 The card machine is slightly more expensive than iZettle and SumUp, retailing at £62.50 + VAT. Transaction fees range from 1.5 – 2.75%. With a PayPal business account, you can get started straight away. Other mobile card machine providers in the UK market include WorldPay Zinc and SmartTrade App. A mobile card reader is a device that connects to your phone or tablet and enables you to process card payments anywhere there is WiFi or a mobile network connection. They differ from traditional credit card terminals as they’re more cost effective, easier to setup and enable sales from anywhere with better connections. It is a great option for businesses that operate outside fixed premises, and for those that process many card transactions. Most providers don’t tie you into long contracts, and there are no monthly fees. 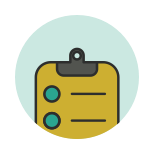 Research and compare providers to find the best option for you. Though it’s important to work out your current average number of card transactions before making any investments, it’s likely that this number will continue to rise as we become an increasingly cashless society. So the big question is, are mobile credit card machines a worthy investment for your business? Simply put, if you’re going to accept card payments, we think mobile card readers are undoubtedly the best option currently available for small businesses. Best Mobile Card Machine in UK – SumUp or iZettle?